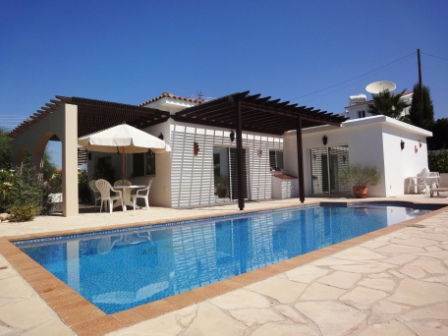 Tala, Paphos , Cyprus - This impressive custom-designed detached bungalow sits on a sizeable corner plot at the end of a quiet residential cul-de-sac in the village of Tala. Local shops are nearby, together with the popular quaint village square with it’s wide variety of restaurants and tavernas. The property features a stylish entrance hall with stone facia walls and archways on each side. To the right is a spacious living/dining room with a stone feature fireplace and chimney. There are windows all around and an archway frames the corner kitchen which is well equipped and has plenty of cupboard space. Patio doors lead from the dining area to the outside verandas and tiled 10m x 4m swimming pool. To the left of the entrance foyer is a hallway leading to 3 double bedrooms, all of which have fitted wardrobes. The master suite, being the largest of the bedrooms, has a spacious en-suite bathroom with bath, vanity unit, heated towel rail, fitted cupboard and separate shower. Bedroom two and three share a good size shower room, again with vanity unit and heated towel rail. A wide L-shaped covered veranda provides a lovely cool place to relax and for outdoor dining. The landscaped gardens are mature and hedges provide good privacy to the plot. There is a useful storage area at the rear of the driveway, and the large pool pump house has a workshop area. Being the owner’s current home, the property is maintained to an excellent standard, and has many extras such as oil central heating, fly screens, double glazing with reflective glass, and pressurized water /softener system. It is ideal as a permanent home, or as a holiday retreat.